When your mid-term is four days away, a quiz awaits you in three days, and a senior asks whether you want to play a role in the drama to be performed at Valhalla – the sports and cultural fest of XLRI, in two days’ time, the first instinct of any first year IIM student, struggling with her Greek and Hebrew subjects, would be to say “NO!!! Are you freaking crazy?” I had the same feeling at first, although I could feel a prick within. The play being enacted was “Lajja”. We had prepared and performed this play at IIM Ranchi’s Foundation Day, and I had played a very significant character of the drama. It was a bold depiction of the evils of society that try to bring down the dignity and freedom of women at large, with a particular focus on the inhuman incidence of “Nirbhaya”. The idea of the play is to question the society on the face and remind them of the innate power which every woman possesses. That night when I happened to pass by the ongoing rehearsals, I couldn’t help but take a look. What followed was being pursued by everyone to take part in it. My inner-voice was actually waiting for this stimulus, and I ended up listening to my heart! So there I was, at XLRI on Saturday, 30th July. The moment I stepped into the campus, along with the official drama team of IIM Ranchi “Dramebaaz” accompanied by few other sports teams of IIM Ranchi, a very positive vibe surrounded my senses and I almost forgot about the anxiety of the forthcoming tests. 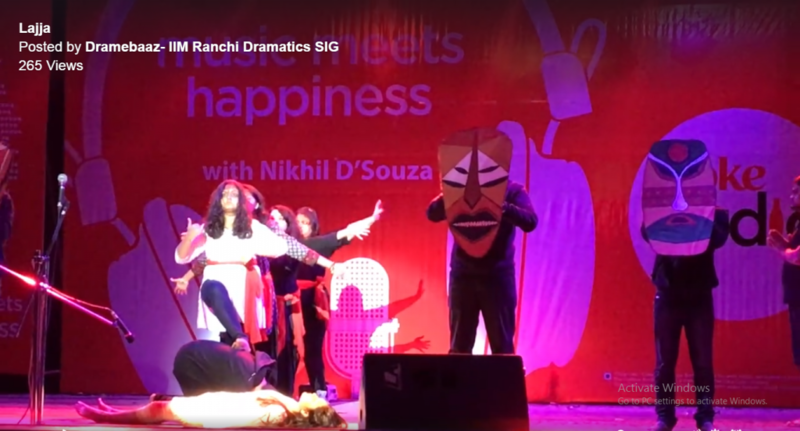 Since we were to perform on the next day, the evening was all about absorbing the wonderful ambience of Valhalla, trying out the famous food items of XLRI and cheering for the sports teams of IIM Ranchi and soon it was the day for performance. We had thought of stealing the stage for one last rehearsal before our final performance, but little did we know that God had other plans. So, just before we were about to start, we realized that the bag containing all our props was missing! We quickly decided to apply our “Crisis Management” skills and gather new props and make use of existing available resources. Just when we had thought our struggle was resolved, a new crisis emerged. The sound system was not compatible with the laptop containing our music files!!! Now that spelled dooms day for a play depending completely on background track as dialogues were very limited. We somehow managed to transfer the files to another laptop and soon it was time for the performance. The hurdles had instilled in us more determination than ever. Every member of the team outperformed themselves on the stage and it was highly applauded. We got a feedback from the audience that everyone had goose-bumps during the performance. Our hard work did pay off and the judges declared “Dramebaaz” the first Runner Up!!! We were all super ecstatic. On my journey back to Ranchi, I reflected that whenever there is a positive gut feeling, one should not hold oneself back. The inner instincts are almost always right and it always results in a positive outcome. She is a PGDM student of 2016-18 batch at IIM Ranchi. She likes to do anything under the sun that involves creativity. Her interests lie in Dramatics, Painting, Travelling and meeting new people.